This Situation Update describes events occurring in Bu Tho Township, Hpapun District between February and July 2014. During this period, local villagers reported challenges in securing their livelihoods following a poor harvest, information regarding access to healthcare, community efforts to establish a school, allegations of corruption against the Burma/Myanmar government and frustration with a lack of support from the Karen National Union (KNU). The following Situation Update was received by KHRG in July 2014. It was written by a community member in Hpapun District who has been trained by KHRG to monitor local human rights conditions. It is presented below translated exactly as originally written, save for minor edits for clarity and security. This report was received along with other information from Hpapun District, including 28 interviews and 210 photographs. I travelled to the village tracts in Bu Tho Township between February and July , and some cases were reported by the villagers. From the opinions and statements of villagers, I received news regarding human rights abuses committed against villagers, Burmese government corruption, the destruction of villagers’ drainage [systems] due to road construction by the Burmese government, the [general] situation of villagers, health, education and other things, and I reported it to the leaders at [KHRG] headquarters. Most of the villagers in Bu Tho Township, Mudraw [Hpapun] District are working on [flat field] farms and hill field farms. There are no business [opportunities] for any of the villagers. Sometimes, their paddy is not good because it is destroyed by insects, wild pigs and other animals. Therefore some of the villagers have to buy rice for the whole year and some of them have to find [borrow] paddy [from their friends]. Some of the villagers in Kyaw Pah village, Meh Klaw village tract do not have enough paddy for 2014 [due to a poor harvest in 2013] and it has become a problem for them. They have seen that the Burmese government distributed money [in the form of loans] with many different names like Ma Taw Ngwe [subsidy] and Myat Hsay Yaung [green emerald]. They distributed it to people who wanted it; some of the villagers who do not have enough food to eat took the money that the Burmese government distributed. The villagers have to bring a recommendation letter from the village head and the village head has to sign it and vouch for the villager to enable them to get the money. The village head has to pay the money back if the villager who borrowed the money runs away. 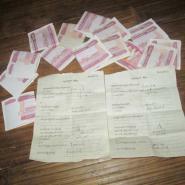 The money lent by the Burmese also has interest. They also lend it to villagers who live on the hillsides. Everyone has to pay back the money with interest after six months. They can borrow again after they have paid it back. They have to pay back the money with interest every six months and they are given a receipt. I took a photo of [one of] the receipts. I also took photos of the money that they were given. 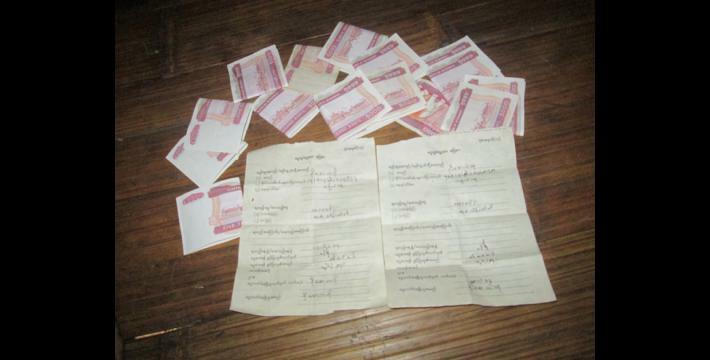 The [Karen National Union (KNU)] village tract leader of Meh Klaw village tract wrote a letter after a villager had taken money lent by the Burmese government. I also took photos of the letter written by the leader of the village tract [of Meh Klaw]. In the letter, the village tract leader told the villagers that he had heard that the Burmese had a plan to lend money to villagers, and that the villagers should not [necessarily] take the money. Instead, [they should] meet with responsible people and decide whether they should borrow the money or not. Regarding healthcare, there is no medicine given by the government in our Bu Tho Township. We do not need to pay money if we go to our Karen hospital [supported by the KNU]. The Karen hospital does not ask [patients to pay] the cost. In a government hospital, when you suffer from a serious disease, the doctor will give you good care if you have money, and they do not even want to examine you if you do not have money. Some villagers said that their house is far from the Karen hospital and therefore they have to go to a Burmese hospital [government hospital]. Sometime we are [financially] weak when we are suffering from big [serious] diseases. Sometimes we have money and sometimes we do not have money. Therefore, the medics do not treat you very well if you do not have money when you go to Hpapun General Hospital. In a village called Kyaw Pah in Meh Klaw village tract, Bu Tho Township, the villagers gathered together and rebuilt and set up a school in 2014. There was no school from 2007 to 2013. Now a tharamu [female teacher] has come and volunteered herself so that the children can be educated. This tharamu does not receive support from either the KED [Karen Education Department] or the Burmese government. The parents of the students give her rice and other food. There are six students and the grades are from kindergarten to grade one. I have seen that the students are very eager to learn. Some villagers whisper [talking about corruption] about the Burmese government who administered Hpapun city from 2012 to 2014. The government has to give money to some people when they are doing business [working for the government], but the government has not given the full amount of money yet. The Burmese government promised that they would pay a certain amount of money to the villagers for building roads and bridges but the government did not give the full amount. Therefore the villagers are upset. A new district leader of Hpapun from the Burmese government named U Hsan Hsint came in 2014. The villagers said that the administration of U Hsan Hsint is strict for the villagers. A villager from Hpapun told me another short story about the situation of the Burmese government in 2014 and I am reporting it. This villager lives in B---, Hpapun [town] in Meh Klaw village tract, Bu Tho Township, Mudraw [Hpapun] District. Her name is Daw--- and she said that none of these people [government people] had come to her area before the ceasefire. Now they come and bully the villagers and car drivers. They had a meeting and ordered that each car [driver] should pay [a certain amount of money to use the road]. Moreover, they misappropriated money sent from above [the government, which was meant] for the villagers. The person who misappropriated the money from civilians is the Chairman of Ma Ya Ka [the Township level government administration]. He works with Aung Than Zaw, the District Chief of Police and Myint Naing, the Township Chief of Police, and [someone called] Han Sein. They worked together and bullied the villagers in the Hpapun area. I am writing it as the villager who reported it told me. This situation update covers a six-month period and as mentioned above it is about the situation of the villagers. The villagers who suffered abuse also reported that they want the fighting to break out again because they do not like the police [a sarcastic statement meaning that they feel that in some ways, life was better before the ceasefire]. 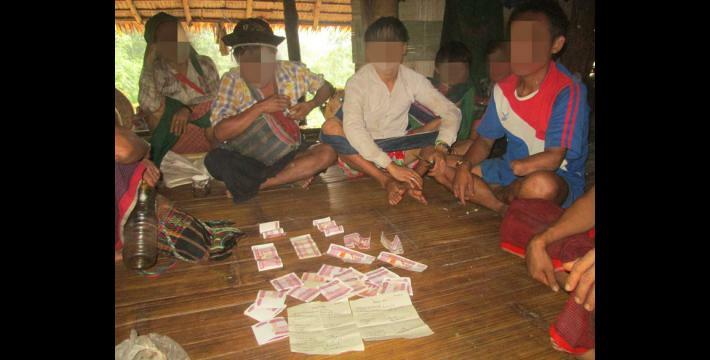 Another case is our leader from the KNU does not allow villagers to borrow money from the Burmese government in Kyaw Pah village, Meh Klaw village tract. However, the villagers reported that [although] they [the KNU] do not allow them to borrow money, they do not lend them money [either]. They [the KNU] do not know their rice is gone. The villagers always pay them tax. They do not see [take care of] the villagers’ weaknesses even a little. This voice came from the villagers. 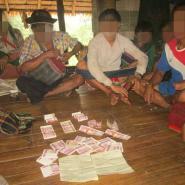 The villagers borrowed this money not to do business but to buy rice, salt and fish paste. The villagers also said that their heart [behaviour] will not become like the Burmese even though they borrowed money from the Burmese. I tried my best and wrote up this Situation Update and reported about the hardship of the villagers. All conversion estimates for the Kyat in this report are based on the 23rd September 2014 official market rate of 988 kyat to the US $1.